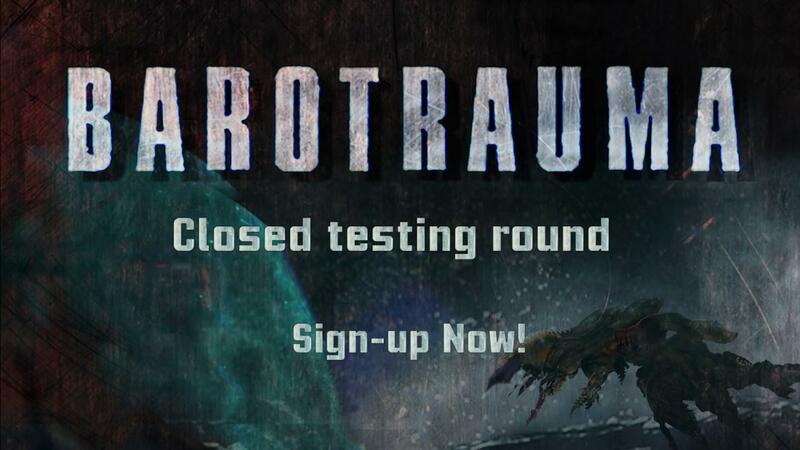 For those after a more sci-fi take on the co-op submarine adventure, Barotrauma seems like it could be quite fun. Currently in a closed-beta before an Early Access release on Steam, you can actually grab an earlier version direct from their website here. They're not taking on any more for the closed-beta, so the demo should still give a small glimpse into what's possible. After trying it out myself with the older demo, I can see a lot of promise in it. Especially compared to We Need To Go Deeper (a similar game) which I found too messy. A note about the demo, if you find input and movement a bit odd, it suffers from a similar bug to Unity games with input being doubled up (seems it's using MonoGame). You can get around it by using the same fix detailed here. I've let the developer know about it, so hopefully they can update SDL2 to fix it. Overcome crisis and the unrelenting pressure of a frozen ocean. In the not too distant future, where habitable places have become scarce, humanity has arrived on Jupiter’s moon. Europa with its frozen surface is a hostile environment, and life can only be found in the dark ocean beneath the ice – and the small pockets of human habitation are not the only form of life to be found there. Play with friends in adrenaline-filled co-operative gameplay, navigate Europa’s frozen depths in single player mode and transform the game with fully integrated mod tools and Steam Workshop. Procedural levels and events ensure no two games will ever be exactly alike. Play as a submarine captain, engineer, mechanic, medic or assistant. Help your teammates survive, or make sure no one does. Operate the many onboard systems of your submarine, from nuclear reactors to sonar, guns, engines and more. Create tools, drugs and weapons with the comprehensive crafting system. Navigate dangerous environments and flee or fight the creatures that you encounter. Explore alien ruins and wrecked submarines to discover rare and powerful artifacts and resources. Unleash your creativity with the submarine editor, character and procedural animation editor, procedural level editor and sprite and particle editors. Share and discover mods directly via Steam Workshop. Follow it on Steam, the Early Access release should be in Q1 so it's likely to be available either this month or next. They're aiming for a full release in Q3 (July-September). A co-op submarine adventure taking place on another planet(oid)? Now that's what I call a pitch! Yeah, there is lots of talks among space nuts like yours truly and scientists about the possibility of small organic life under the hypothetical oceans of extraterrestrial bodies. Life which would look like what you find near volcanic fumes at the bottom of our terrestrial oceans at best. Europa, Ganymede and even one of Saturn's moons, Enceladus are expected to have oceans under a very thick layer of ice. There has been space probes examining the moons of Jupiter. The pioneer and voyagers were flybys. Galileo was an orbiter and paid more attention to the moons in general. There are talks about a mission that would orbit Europa and hopefully determine how thick is its layer of ice. And hopefully there would be following missions with a lander and later a cryobot -probably nuclear- that would melt a tunnel in the ice and explore the ocean beneath. You can find a lot of accessible vulgarization about all that on the net with neat pictures and all. Back to the game video it looks neat. A bit hard on my willing suspension of disbelief though but you have to make some game material. There was another submarine co-op game mentioned on GOL a while back . Think Samsai played it as well. But it lacked polish and a tutorial. Looks pretty damn good, but if it is spooky, I can't play it. Dedale There are talks about a mission that would orbit Europa and hopefully determine how thick is its layer of ice. And hopefully there would be following missions with a lander and later a cryobot -probably nuclear- that would melt a tunnel in the ice and explore the ocean beneath. I don't know, man ... I thought we weren't supposed to make any landings there. Otherwise all the other worlds are ours.